Keep the Salt River Alive! The Salt River Watershed Council was very pleased with the community turnout at our “Keep the Salt River Alive!” event on Saturday, October 24. If you were there, then “thank you” for attending! If you couldn’t make it, but wanted to see what you missed, please go here. The wonderful Ferndale student artwork about the Salt River which adorned the walls of the community center can be viewed below. How to Build a Bridge in One Day! The initial construction phase of the new Port Kenyon bridge has been completed and Francis Creek is flowing under Port Kenyon Road once again! On Tuesday, October 27, the new bridge arrived in pieces on multiple flatbed trailers. By the end of Tuesday, the bridge infrastructure was completed. It was an amazing engineering feat to behold! 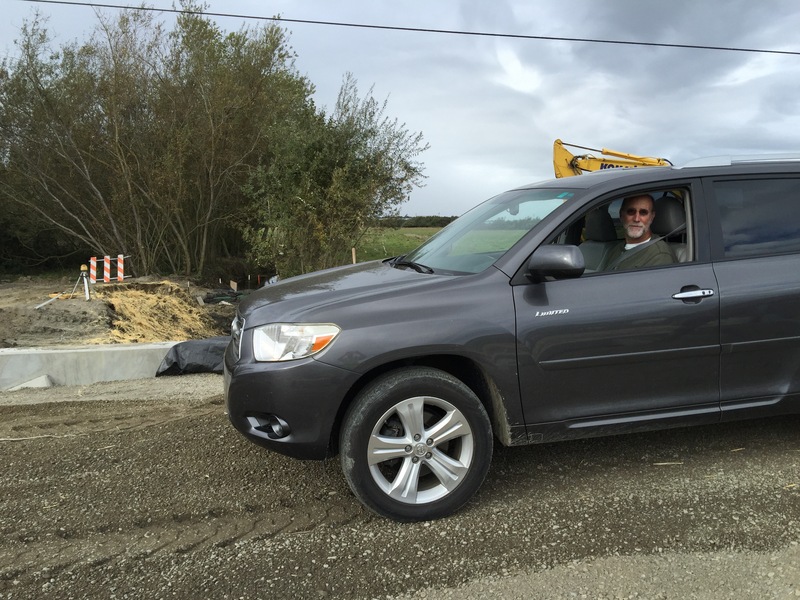 On Saturday, October 31, I was allowed to be the first vehicle to drive over the new bridge. Later that day, the two dams holding water back on either side of the bridge were removed. Today, November 1, Francis Creek is flowing from Ferndale and under the new construction. There is still more work to be done to complete the project like paving the roadway. November 1st and Francis Creek is flowing again! The 2015 Salt River Ecosystem Restoration Project is in Full Swing! Phase 2 of the Salt River Ecosystem Restoration Project has begun its 2015 construction season. Sediment removal has begun just east of the Dillon Road bridge where the construction concluded last November. Sediment is also being removed from the Salt River channel just below Ferndale’s Waste Water Treatment plant. Trucks carrying sediment are exiting the construction site daily. The sediment is being deposited on the Cahill Dairy on Fulmor Road. This phase of the project will conclude in October. In addition, the Francis Creek culvert on Port Kenyon Road will be replaced with a new structure by the Humboldt County Public Works Department in August. The work will include clearing 75 feet of the Francis Creek channel on both sides of Port Kenyon Road. Photos of the Salt River Project construction sites and “before” photos of the Francis Creek existing culvert are available to view on the Salt River Watershed website. On March 13, 2015, the Eureka Times-Standard published an article on the USDA providing funds to farmers in the Salt River Watershed to reduce sediment impairments. Phase 2A of the Salt River restoration has been completed! Phase 2A Lower of the Salt River Ecosystem Restoration Project has been completed. The construction contractor, Handford Applied Restoration and Conservation from Sonoma, California has finished their work. The work began during the last week of July and was completed in November. Over 100,000 cubic yards of sediment was removed from the channel. Vegetation planting has begun and will continue through winter. The coffer dam at Reas Creek has been removed. The tidal flow is now moving from the confluence of the Eel River delta to the Dillon Road Bridge. Local Farm Bureau Attends Salt River Project Tour! 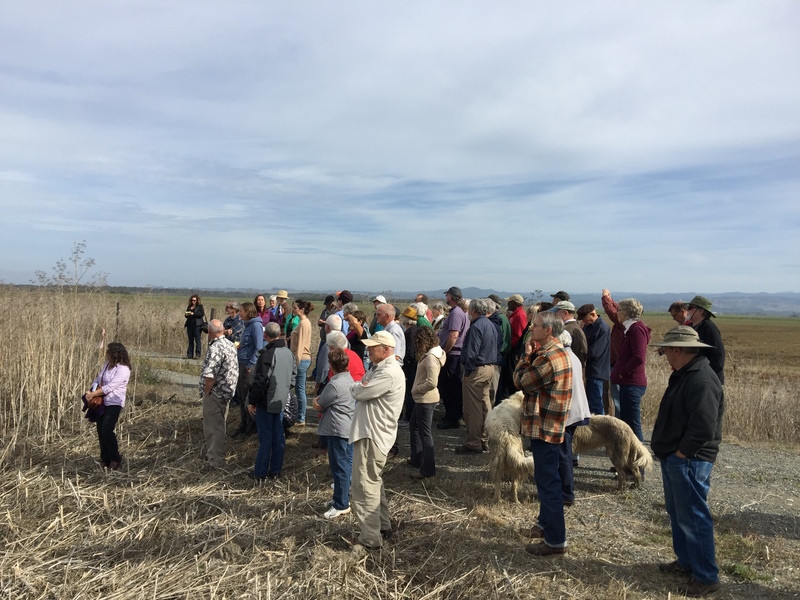 Members of the local Farm Bureau and the Salt River Watershed Council (SRWC) attended a site tour of the Salt River Ecosystem Restoration Project on November 13, 2014. The tour was hosted by the Humboldt County Resource Conservation District (HCRCD) which is the lead agency on this project. 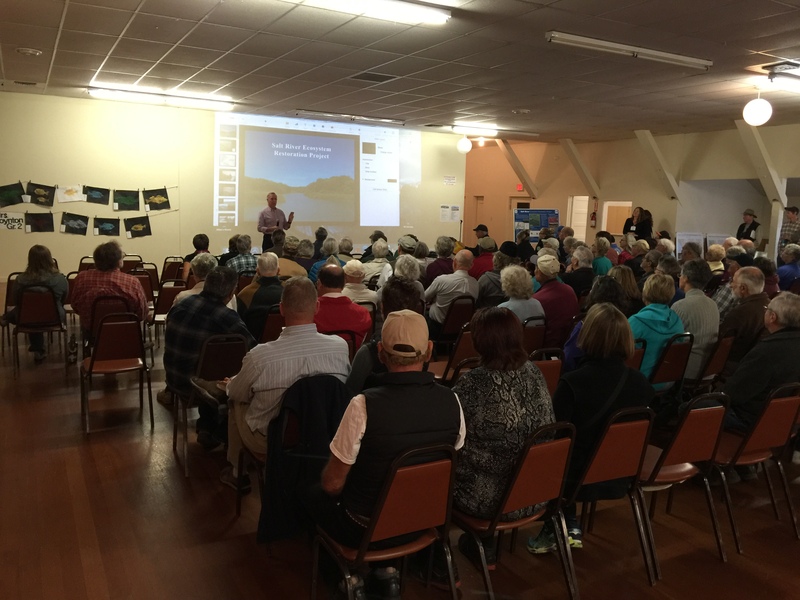 Over 30 attendees met at the Humboldt County Fairgrounds in Ferndale, received a brief overview and map, and then drove to four locations along the length of newly restored Salt River. Four sites were visited including the Dillon Road Bridge, Port Kenyon, the Riverside Ranch and the tidal marsh and pasture lands near the mouth of the Salt River. Doreen Hansen, Donna Chambers and Curtis Ihle of the HCRCD gave a brief talk and answered questions at each stop. Jay Russ, current SRWC chairman, also was on hand to represent the council and an answer any questions. Check out the tour photos below. The first SRWC Newslette r was mailed to all residents in the 95536 zip code area on October 1, 2014. The mailing also included a survey. Read the newsletter SRWC news. Take the survey online here.